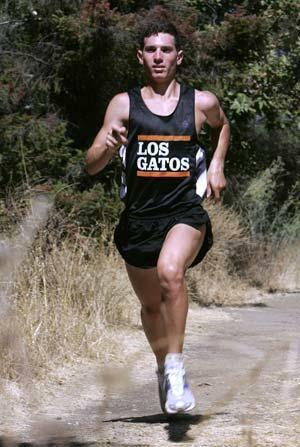 Los Gatos senior Matthew Petrillo says of running, "I don't do it because I think I have to. I do it because I love it." The meeting was Matthew Petrillo's idea. And an answered e-mail led the Los Gatos High senior into an Oahu rain forest. As he and the legendary Gerry Lindgren ran side by side past guava and banana trees in Hawaii this summer, it occurred to Petrillo that he was running beside one of the few people who could truly understand him. As well-known as Lindgren was for his distance-running accomplishments -- one world record, five U.S. records, 11 NCAA titles -- he may have been even more renowned for his training. During one six-week stretch while at Washington State, Lindgren ran 350 miles per week, 50 miles per day. Each Sunday during high school in Spokane, Wash., he ran 88 miles from his home to a mountaintop and back. Petrillo, the defending Central Coast Section Division II cross-country champion, topped his summer training with a 200-mile week, finishing with a 30-mile run to New Brighton Beach. Today's training philosophies often discourage such mileage -- most high school distance runners log 35-70 miles per week -- and conventional wisdom says Petrillo is setting himself up for injury or burnout, an assessment he disputes. He stretches well, takes days off when he feels poor, and buys new shoes every 300 miles. And Petrillo, whose weekly mileage dips to 100 during the season, has never had an injury because of overtraining. Lindgren, an assistant cross-country and track coach at the University of Hawaii, ran during the 1960s and '70s, an era when it was common and even encouraged to run a lot of miles. The era would have suited Petrillo: ``I'm a typical '70s runner,'' he said. But American training methods today emphasize quality over quantity -- harder workouts over less distance. Meanwhile, runners from the dominant East African countries continue to run 175 to 250 miles a week. ``The restrictive nature of distance running in America today is unacceptable,'' Lindgren, 60, wrote in an e-mail. And burnout is caused when ``you get to the point where you don't enjoy what you're doing. Petrillo, who found a kindred spirit in Lindgren, agrees. Petrillo (5-foot-8, 145 pounds) isn't one-dimensional. He played numerous sports throughout his childhood, carries a 3.6 grade-point average and spent the summer working at a homeless shelter. But for Petrillo, there is nothing like the feeling of returning home at 6 a.m. after an hour on the roads, or heading into the hills with his teammates for a 10-miler in the afternoon heat. Still, Newman said he felt he was in an awkward position. Reluctant to compromise his principles, he said he spent many sleepless nights wondering what to do. Newman finally allowed for flexibility. Petrillo runs every workout with the team and does extra work on his own. The compromise seems to have worked to the team's advantage. Newman credits Petrillo's enthusiasm for inspiring his teammates, who won the CCS title last season. The number of miles isn't important, Petrillo says, it's the work and preparation, a philosophy Petrillo and Lindgren share.